The Traveler Beer Company continues their partnership with MuckFest MS and the National Multiple Sclerosis Society for the 2016 season. Participants of legal drinking age can celebrate with a free Traveler Beer at the finish line this year. In 2016, muckers in 11 cities across the country will toast their mucky 5K run with a refreshing Traveler Shandy. This is a continuation of the sponsorship which started in 2015 between the two companies. The 2016 season kicks off in Boston on May 14-15. Registration is now open at www.MuckFestMS.com. The MuckFest MS series supports people living with multiple sclerosis, and brings us closer to a world free of MS. 100% of fundraising dollars support the National Multiple Sclerosis Society’s mission to stop MS in its tracks, restore what has been lost and end MS forever. Traveler beers are American craft wheat ales inspired by the classic European shandy, and are made with real fruit, like lemon and grapefruit, making for a deliciously refreshing drinking experience after a muddy, mucky 5K. Runners will be able to choose from Traveler Grapefruit Shandy or a seasonal Shandy offering. In addition to having a large presence at the MuckFestival, Traveler Beer is also supporting MuckFest MS with the #KickTheMuck photo contest. Fans are encouraged to share their photos that best represent how they “Kick the Muck out of MS” for a chance to win a trip for two to MuckFest Los Angeles, including airfare, hotel, a VIP experience at MuckFest Los Angeles, and $250 travel money. To read the full rules and to enter, fans can visit www.travelerbeer.com/kickthemuck or the #Kickthemuck photo contest app on the Traveler Beer Facebook page. “It’s happy hour for our participants at MuckFest MS, thanks to support of The Traveler Beer Company. We’re extremely grateful to have them on board as the national MuckFestival sponsor once again,” said Betty Ross, Vice President, Emerging Events, National MS Society. So far, MuckFest MS event participants have raised over $22 million. 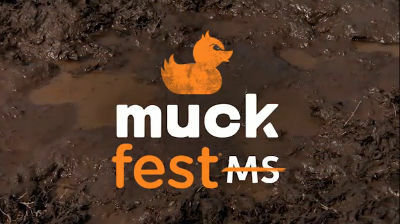 Find a MuckFest MS Near You! Use discount code MUDRUNGUIDE for $7 off your MuckFest MS registration!